Anyone knows where we can rent a PhotoBooth in Selangor / KL ? im looking for one too..hopefully someone here could help.. I knoe one of the site related to the weddingguide, photos, arrangements etc. I dont have any idea about it . Pretty glad to know that you are interested with photobooth...as we are too! :) Basically we're yet to find photobooth service in Malaysia, because of that, you can actually setup the backdrop yourselves, we can give a little idea on that if you one. :) And get your photographer to setup the tripod and take the photos. Yes, no doubt it does not have that instant photo printing, but the result is good as well! Just pour in whatever accessories and poses...! Something we have photographed during a ROM Party. Cynthia printed all these lovely printouts. No fancy backdrop but it's the fun, laughter and cheekiness they shared that makes photobooth shooting fun! Really need to compliment...the photo gave me a warm feeling. Good Job! 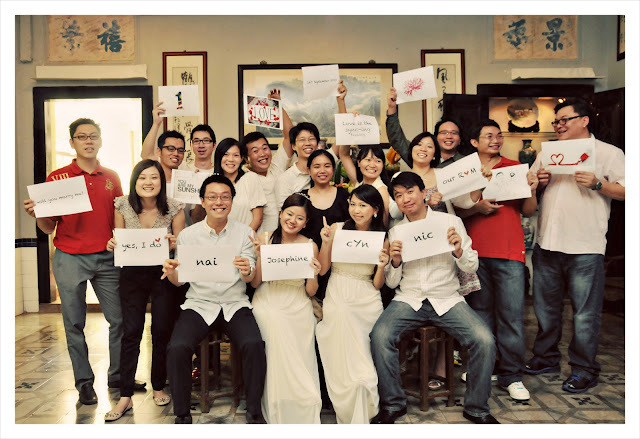 yes also know someone who offer photobooth service for an affordable price..
cool! more options to choose from. :) Actually, i was having hard time before cuz i only found few sevice provider of this type in the internet. Ive checked poseandsnap and its the best deal i was able to find so far. Great for my budget But, I also emailed stresslesswedding for the package and the price, so i can compare also. Tq for this info :) Btw, do they have a website? Spell thinking for our ritual we decided that it would be outstanding to use a picture assassin as our temporary production. After hunting at belongings costs I definite to cover it upon myself to form my own, and since I like projects equal this I content it measured equal a lot of fun! and all my guest are pretty much impressed with their creativity! I'm also looking for a photobooth for my wedding. Based on my research so far, stories.my offers photobooth for RM1.5K, incl. props & photographer. Can't remember if backdrop is included. I am thinking of asking sprinkledwithstyle.com to do my backdrop for me. That's a very good one. thanks for sharing! I got http://www.poseandsnap.com for our photobooth on our wedding next month. Hi you can check us out @ facebook.com/coolshotsphotobooth =) Cheers! Hi you can check us out @ facebook.com/coolshotsphotobooth Cheers! hi you can check us out @ www.facebook.com/coolshotsphotobooth =) Cheers! @kharen11 - How did the photobooth go? Thinking of getting them too. Since our wedding was measures evaluate personal declares gone it had to be quickly mobile. And since it was our wedding it had to delay as adult as researchable, and be complete automated. With those canonical demands and a lot of use I finished up with something that everyone was joking with.. There are many online websites available where you can find the best photo booth for your party. these days many people keep it in the parties and wedding day so that best moments can be captured. I always book it online and they come to my pace and installed it. The best thing is it suits the budget also. Click Capture Pod to know more about it. d photobooth was soo fun..last time when i joined my fren wed dinner..they made it like u r a super star walking in red carpet,,,like oscar surround by 5/6 camera..makes u looks like a superstar..
wow, sound very interesting on having photo booth! how much cost if having photo booth, roughly price? anyone have idea?